Senior vice president Yusof Rafie throws the first pitch. 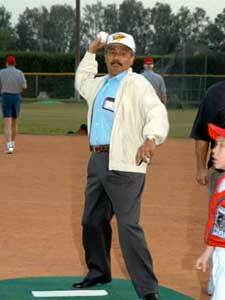 DHAHRAN, February 17, 2005 -- With the words "Play ball!" 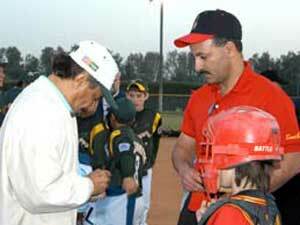 the 2005 Dhahran Youth Baseball Association (DYBA) season got under way recently at the Pee Wee Field complex. Yusof Rafie, senior vice president of Industrial Relations, threw the first pitch. Several hundred players and parents from Saudi Aramco's international workforce attended the Opening Ceremony for a night of baseball and hot dogs. "People make things happen, and Saudi Aramco has always been able to count on the skills and talents of its employees to get the right things done the right way," said Rafie in praising that workforce. "The company employs expatriates from more than 50 different countries throughout the world, with one goal in mind: making a better company." "The company is proud of this heritage," Rafie said, "and just as the company is stronger with our multinational workforce, so is our baseball program, as evidenced by your enviable record." Turki Al-Harthi and his son, Majid, who caught the first pitch. This past summer, DYBA members triumphed in Kutno, Poland, and brought back the European Championship. Their hard work and determination resulted in an 8-0 record. They outscored their opponents 103-4, and their pitchers pitched four no-hitters. The team's main rival was Germany, whose players began celebrating after winning their semifinal qualifier. Their manager cautioned them about over-confidence and warned, "But now we must go slay the dragon." But the dragon - the DYBA - slew them. Yusof Rafie pitches the first ball to catcher Majid Al-Harthi. The DYBA has won 10 of the last 11 and 16 of the last 20 European Championships. "Your record reflects the various talents and skills of each and every player, just as Saudi Aramco's history reflects the efforts of our multinational workforce," Rafie said. "Congratulations on your past record. Make yourselves proud of your efforts this season." Dhahran baseball is not only about travel teams and competition. The program starts with 5-year-olds playing T-ball and leading toward the Pee Wee League (ages 6-9). 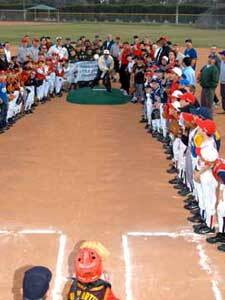 Youngsters learn the basics of baseball and good sportsmanship while playing in a fun environment. No prior knowledge of baseball is required, and kids can join at any age level. The programs run two to three times a year for all age and experience levels. The DYBA aims to provide both a recreational and competitive program to meet the needs of the whole community.